There is only one sure-fire way to get a cabin upgrade and that is “pay”. The alternative is “pray”. If you are best friends with the CEO of the Cruise Line, that might help too. Getting a cabin upgrade is down to luck, although there is some logic behind it. Cruise ships need to sell all of their cabins, before the departure date. Unlike a hotel, passengers cannot check-in mid-week! the Offering potential passengers deeper and deeper discounts is one solution to filling all of the cabins, but it’s not a great business practice for them. The cabins that sell fastest on a cruise ship are the cheapest grades (normally inside) and the highest grades (the top suites). I suppose in life the majority of people either have ‘money’ or are on a ‘budget’. The middle grades of cabin (ocean view and balcony) sell much slower. If there are unsold cabins at departure time, they will almost certainly be these ‘middle’ grades. This is where cruise lines employ the ‘upgrade trick’. To fill those elusive middle grades, the cruise line upgrades those people in the lower grades, into the middle grades. So if you booked an Inside cabin, you would be upgraded to either a bigger inside cabin or maybe an ocean-view. An ocean-view would be upgraded to a bigger Ocean-view or maybe pushed up to balcony. Then the cruise line can resell the cheapest grades and still claim in their adverts “cruise from £999” (or whatever) and continue to offer their lowest fare. 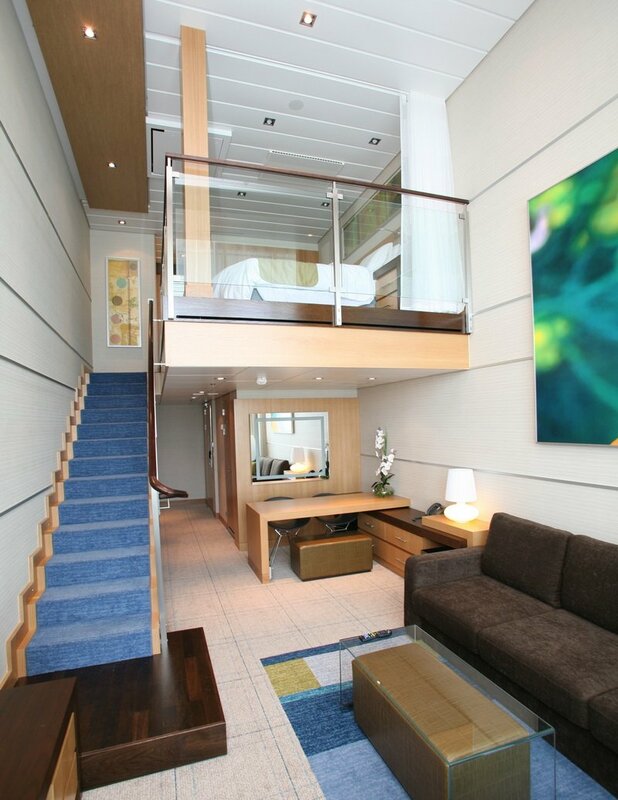 A friend of mine on a mini-cruise was upgraded from a balcony cabins to the Owner suite. Now I assume that in this case no one wanted to pay the very large fare for the ‘Owner’s Suite’, just for a few days. So by default my friend got it. I must just mention that cruise lines often sell a ‘guaranteed’ cabin grade. This means that you are not allocated an actual cabin number when you book, only the grade, until near departure. Although there are no guarantees, this scenario gives the cruise line maximum flexibility to upgrade those passengers who have not selected a particular cabin number and location. So in conclusion, I believe that you are most likely to be upgraded if you have purchased a lower grade cabin and have done so many months in advance. This may mean that you could be upgraded to a middle grade. An upgrade is very UNLIKELY to happen if you make late booking. It is of course it is all dependent on how well the cruise is selling. If the upgrade ‘fairy’ does not cast her spell on you, don’t be disappointed! If you get the cabin grade that you have paid for, you should not be disappointed. If you are upgraded, celebrate! On today’s mass-market ships, mini-suites are often not really ‘suites’ in my opinion, just slightly larger cabins. (On-board Epic, similar cabins were originally called ‘deluxe-balcony’). Sometimes quite late – The cabin number is normally on your final invoice and you are often required to write in on your luggage tags. When would you find out that you’ve been upgraded?